Guava (/ˈɡwɑːvə/) is a common tropical fruit cultivated in many tropical and subtropical regions. Psidium guajava (common guava, lemon guava) is a small tree in the myrtle family (Myrtaceae), native to Mexico, Central America, and northern South America. Although related species may also be called guavas, they belong to other species or genera, such as the "pineapple guava" Acca sellowiana. In 2016, India was the largest producer of guavas with 41% of the world total. 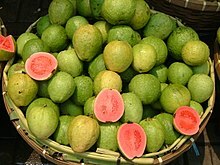 The term "guava" appears to have been derived from Arawak guayabo "guava tree", via the Spanish guayaba. It has been adapted in many European and Asian languages, having a similar form. Another term for guavas is peru, derived from pear. It is common in countries bordering the western Indian Ocean and probably derives from Spanish or Portuguese. In parts of the Indian subcontinent and Middle-East, guava is called amrood, possibly a variant of armoot meaning "pear" in the Arabic and Turkish languages. It is known as payara in Thailand and bayabas in the Philippines. Guavas originated from an area thought to extend from Mexico or Central America and were distributed throughout tropical America and the Caribbean region. They were adopted as a crop in subtropical and tropical Asia, the southern United States (from Tennessee and North Carolina south, as well as the west and Hawaii), tropical Africa, South Asia, Southeast Asia, and Oceania. Guavas are now cultivated in many tropical and subtropical countries. Several species are grown commercially; apple guava and its cultivars are those most commonly traded internationally. Guavas also grow in southwestern Europe, specifically the Costa del Sol on Málaga, (Spain) and Greece where guavas have been commercially grown since the middle of the 20th century and they proliferate as cultivars. Guava fruits, usually 4 to 12 centimetres (1.6 to 4.7 in) long, are round or oval depending on the species. They have a pronounced and typical fragrance, similar to lemon rind but less sharp. The outer skin may be rough, often with a bitter taste, or soft and sweet. Varying between species, the skin can be any thickness, is usually green before maturity, but may be yellow, maroon, or green when ripe. The pulp inside may be sweet or sour and off-white ("white" guavas) to deep pink ("red" guavas). The seeds in the central pulp vary in number and hardness, depending on species. In 2016, world production of guavas was 46.5 million tonnes, led by India with 41% of the total (table). Other major producers were China (10%) and Thailand (7%). In Mexico and other Latin American countries, the guava-based beverage agua fresca is popular. The entire fruit is a key ingredient in punch, and the juice is often used in culinary sauces (hot or cold), ales, candies, dried snacks, fruit bars, and desserts, or dipped in chamoy. Pulque de guava is a popular alcoholic beverage in these regions. In many countries, guava is eaten raw, typically cut into quarters or eaten like an apple, whereas in other countries it is eaten with a pinch of salt and pepper, cayenne powder or a mix of spices (masala). It is known as the winter national fruit of Pakistan. In the Philippines, ripe guava is used in cooking sinigang. Guava is a popular snack in Taiwan, sold on many street corners and night markets during hot weather, accompanied by packets of dried plum powder mixed with sugar and salt for dipping. In east Asia, guava is commonly eaten with sweet and sour dried plum powder mixtures. Guava juice is popular in many countries. The fruit is also often included in fruit salads. Because of its high level of pectin, guavas are extensively used to make candies, preserves, jellies, jams, and marmalades (such as Brazilian goiabada and Colombian and Venezuelan bocadillo), and as a marmalade jam served on toast. ^ "Cambridge Advanced Learner's Dictionary & Thesaurus". Cambridge University Press. Retrieved 20 August 2012. ^ Judd, WS; Campbell, CS; Kellogg, EA; Stevens, PF; Donoghue, MJ (2002). Plant systematics, a phylogenetic approach. Sinauer Associates, Inc. pp. 398–399. ISBN 0878934030. ^ a b c d e f g h i Morton JF (1987). "Guava, in Fruits of Warm Climates, p 356-63". Center for New Crops & Plant Products, Department of Horticulture and Landscape Architecture, Purdue University, West Lafayette, Indiana. Retrieved 24 April 2015. ^ "Thai guava farming gets momentum". Dhaka Tribune. August 28, 2016. ^ "Recommended Herbal Plants In The Philippines". Business Mirror. August 10, 2017. ^ a b c d "Psidium guajava (guava)". CABI: Invasive Species Compendium. 2017. Retrieved 9 October 2017. ^ Sauls JW (December 1998). "Home fruit production – Guava". Texas A&M Horticulture Program. Retrieved 2012-04-17. ^ Boning, Charles R. (2006). Florida's Best Fruiting Plants: Native and Exotic Trees, Shrubs, and Vines. Sarasota, Florida: Pineapple Press, Inc. p. 99. ISBN 1-56164-372-6. ^ Price J (14 June 2008). "Strawberry guava's hold has proven devastating". Honolulu Star Bulletin. Retrieved 7 December 2014. ^ "Leveling the Playing Field in Hawai'i's Native Forests" (PDF). Conservation Council for Hawai‘i. 2010. Retrieved 7 December 2014. ^ a b "Top Producing Countries of Guava". Tridge. 2016. Retrieved 2 April 2019. ^ Nutritiondata.com. "Nutrition facts for common guava". Retrieved August 17, 2010. ^ Nutritiondata.com. "Nutrition facts for strawberry guava". Retrieved August 17, 2010. This page was last edited on 20 April 2019, at 04:42 (UTC).